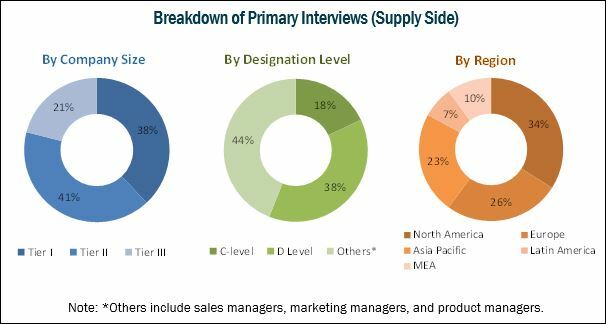 [321 Pages Report] The veterinary diagnostics market is valued at 2.39 billion in 2017 and is expected to grow at a CAGR of 8.8% during the forecast period (2018 to 2023), to reach to USD 4.00 billion by 2023. Base year considered for the report is 2017. According to the APPA National Pet Owners Survey 2017-2018, the canine population in the US increased from 69.9 million in 2012 to 89.7 million in 2016, while the feline population increased from 74.05 million in 2012 to 94.2 million in 2016. According to FEDIAF, the canine population in Germany increased from 5.30 million in 2012 to 8.66 million in 2016, whereas the feline population increased from 8.20 million in 2012 to 13.40 million in 2016. The adoption of pet insurance is expected to increase in coming years. Currently, the adoption of pet insurance in North America is very low as compared to European countries. According to the Department of Clinical Veterinary Science and the Pet Food Institute (US), 30% of pets in Sweden, 23% of pets in the UK, and only 1% of pets in the US are covered by pet insurance policies. The major players in the veterinary diagnostics market are IDEXX Laboratories, Inc. (US), Abaxis, Inc. (US), Heska Corporation (US), Zoetis, Inc. (US), Neogen Corporation (US), Thermo Fisher Scientific, Inc. (US), QIAGEN N.V. (Netherlands), Virbac (France), bioMérieux SA (France), IDvet (France), and Randox Laboratories Ltd. (UK). Zoetis announced a merger agreement, under which Zoetis will acquire Abaxis for approximately USD 2.0 billion. This acquisition is expected to enhance Zoetis’ presence in the veterinary diagnostics market. Under this partnership, Pathway Vet Alliance will align its internal diagnostic portfolio with Heska to elevate veterinary care nationwide. *Other immunodiagnostic products include assay tests such as agglutination tests, fluorinated agglutination tests (FAT), immunohistochemistry, Western blot tests, non-infection immunoassays, complement fixation, agar gel immunodiffusion, and serum/virus neutralization. *Other molecular diagnostic products include DNA sequencing, genotyping, DNA profiles, and next-generation sequencing. 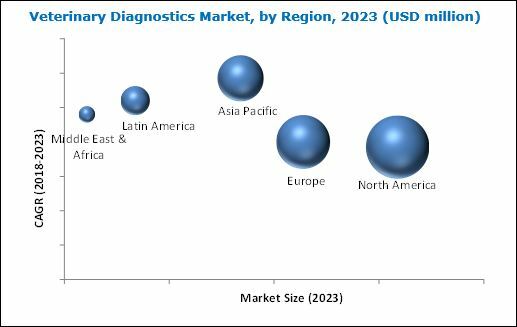 The veterinary diagnostics market is projected to reach USD 4.00 billion by 2023 from USD 2.63 billion in 2018, at a CAGR of 8.8%. Factors such as growing companion animal population, growing prevalence of animal zoonotic diseases, rising demand for animal-derived food products, rising demand for pet insurance & growing animal health expenditure, and the increasing number of veterinary practitioners and income levels in developed economies are expected to drive the growth of the veterinary diagnostics market. However, the increasing pet care costs may restrain the growth of the market. The market is segmented based on the product, technology, animal type, end user, and region. Based on the technology, the immunodiagnostics segment is expected to account for the largest share of the market in 2018. The large share can be attributed to the high accuracy of immunodiagnostic tests, high preference for these tests by veterinary practitioners, and its wide applications in veterinary diagnostics. Based on animal type, the veterinary diagnostics market is categorized into livestock and companion animals. In 2017, the companion animals segment accounted for the largest share of the veterinary diagnostics market. The large share can be attributed to the increasing companion animal ownership, growing awareness about animal health among pet owners, and rising pet healthcare expenditure. By end user, the veterinary diagnostics market is segmented into veterinary reference laboratories, veterinary hospitals & clinics, point-of-care/in-house testing, and research institutes & universities. Veterinary reference laboratories are estimated to account for the largest share of the market in 2018. The large share of this end-user segment is mainly due to the large number of samples received for analysis in reference laboratories from small and large animal practices. 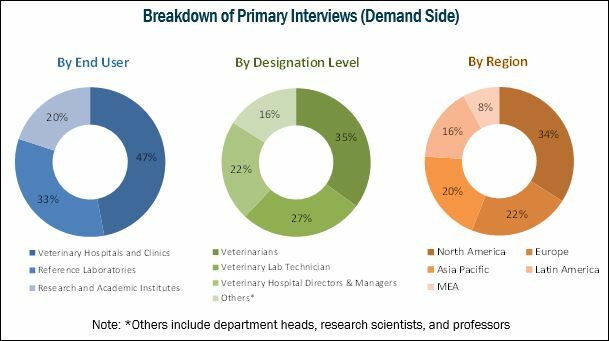 Geographically, the global veterinary diagnostics market is segmented into North America, Europe, Asia Pacific, Latin America, and the Middle East and Africa. North America is expected to hold the largest share of this market in 2018. This is primarily due to the growing adoption of the companion animals, growing demand for animal-derived food products, and growing number of veterinary practices in the US. On the other hand, the Asia Pacific region is expected to grow at the highest CAGR during the forecast period. The large pool of livestock animals and growing awareness about animal health are driving the growth of this regional segment. IDEXX Laboratories, Inc. (US) and Abaxis, Inc. (US) dominated the global veterinary diagnostics market in 2017. Some of the other players competing in this market are Thermo Fisher Scientific, Inc. (US), Neogen Corporation (US), Heska Corporation (US), Zoetis, Inc. (US), QIAGEN N.V. (Netherlands), IDvet (France), bioMérieux SA (France), Virbac (France), and Randox Laboratories Ltd. (UK).